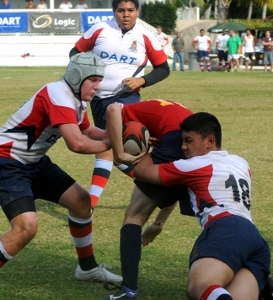 (CRFU): Local Rugby is enjoying an influx of visiting tourists to these shores looking for a Cayman Rugby experience and although Dartmouth University have made an early impression so far winning 2 out of their 3 games on Island it is Holy Trinity High School, a team from Ontario Canada that was left licking its wounds on their 2nd trip to the Cayman Islands since Hurricane Ivan. Not only has the Cayman Rugby Football Union rebuilt its clubhouse, fixed its pitch and made continual improvements to its grounds since the hurricane but the Junior Rugby program, under the tutelage of Coaches Russell Hayward, Noel Phillips and Gary Southway, has also gone from strength to strength. The Cayman U17’s played a series of 7 a side matches on Monday followed by a full XV’s match against their Canadian counterparts and all matches were won in landslide fashion by the young Caymanians with the highlight of the day being a 60-0 hammering in the full XV’s fixture. The Holy Trinity rugby program does not have the Cayman Islands benefit of nearly 365 days of good (if a little hot) rugby playing weather and has to cram it’s rugby program into a 12 week window before cold weather conditions make rugby playing impossible if not unbearable and as such a chance to play high quality opposition featuring some of Cayman’s very own 2011 U19 NACRA Caribbean Champion side poses an attractive proposition for any developing side looking to improve its skills before going home to take part in local competitions. The Holy Trinity side, with only a 1 day rest to review defensive and attacking deficiencies played again on Wednesday 21 March and a much improved performance saw another loss but this time only 31-0. Game 1 Monday Final score 60-0. Scorers: Sebastien Legras 1 try, Mark Westin 2 tries, Iain Currie 1 try, William Hayward 1 try 4 conversions, Mike Peck 2 tries 1 conversion, Angel Hawkins 1 try, Gary Watler 1 try, Paul Westin 1 try. Man of the Match (chosen by opposition coaches) William Hayward. Game 2 Wednesday Final score 31-0. Scorers: Jordan Mclaughlin 1 try, Gabriel Soloman 1 try, Paul Westin 1 try, Giovanni Dixon 1 try, Rejeun Henry 1 try, William Hayward 2 conversions, Mike Peck 1 conversion. Man of the Match (chosen by opposition coaches) Michael Peck.